Are you an individual or a company striving hard to offer PR (public relation) Services? But often you are misunderstood as marketing or an advertising agency. You must first establish your service in the right way for your audience and only then you can help them stand in front of their target customers. 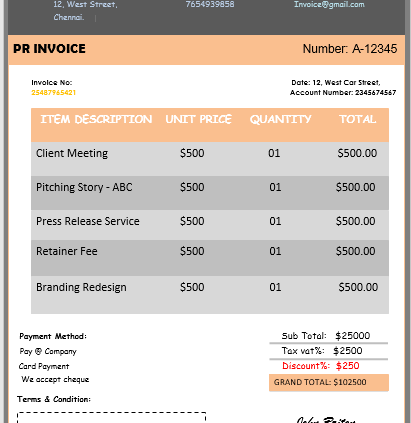 In this article, we are giving away the most professionally designed PR Invoice Templates. Fine, I agree that you might have understood this basic and thus started a PR agency. But, you might wonder how this site can help you run your service successfully? Are we providing marketing research, do we help you in helping your client in social media, at least does our support make you manage the counselling management across your organization level? No, we don’t. Still, we extend a great support to you. Wondering how? 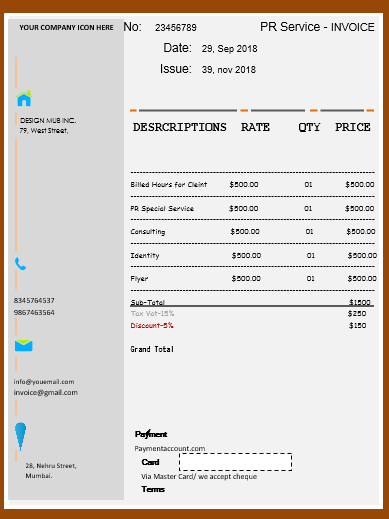 We provide you with FREE PR INVOICE TEMPLATE. Even though invoicing is the last stage in your PR business, it is indeed the most vital stage. You must bill your client for your service and they must be aware of all the services you did to them. Retainer Billing – This is based on the monthly / quarterly/ yearly charges that are being charged to the client on an understanding for standard set of deliverable per billing cycle. Time/Hour based billing – Charge clients based on the number of hours of engagement. For example, number of hours spent on story discussion, public relations services and other client engagements served. Hourly Retainer billing – This is again a type of retainer billing along with hours being charged. Say 250 hours per billing cycle or retainer cycle and being charged for that particular hours on every billing cycle. Blended Rate for Hours – The staff will be billed on standard hourly rate based on the PR agency standards. This is like charging invoice for labor used. Billed on Project – This is a per project billing and billed based on the number of efforts and measured deliverable for projects. Billed on Value delivered – Billing happens based on the amount of value delivered to the client. That can be a commission rate charged based on the revenue generated out of a PR campaign. Read more on the types of billing here. This simple document will explain the value of your service to promote their business. It is the professional document that will help both you and your client achieve the goal. The document will not only tell them about your service but about your professionalism as well. 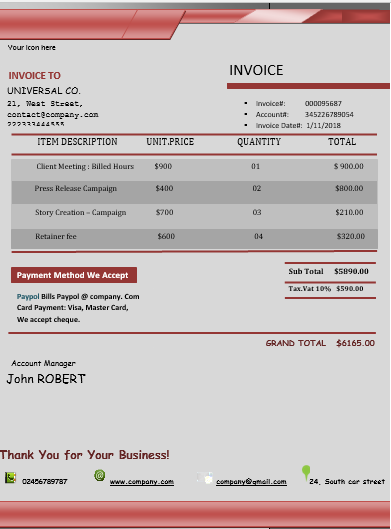 All details mentioned in the invoice will make things clear on how your service helped them to brand their business. Also, the cost for each service can be listed in detail which will give a clarity for both of you and thus they can make a payment to you. Lastly, it will help you to maintain a record of all your services and at the same time follow up with a client for payment. Above all, you and your client both can manage audit and tax with this invoice that will mirror all expense details. You might ask a question. Yes, when we provide you with a free template, then why do you need to learn the process involved in making a template on your own. The answer is simple, any time you feel like editing the document, following these steps will help you to personalize the invoice based on your company norms. Mention your company name and logo if you have one. 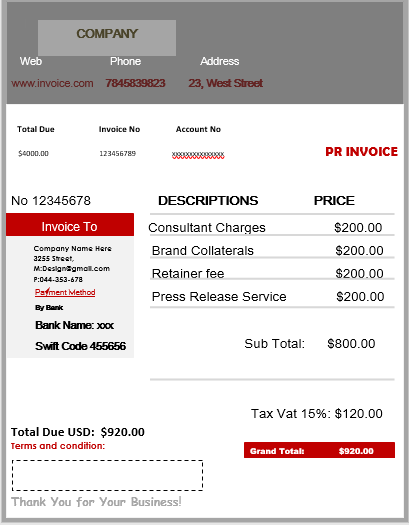 In general mention the title as PR invoice or PR Services invoice, or Invoice for PR Consulting etc. You can edit the title and give it an appropriate name based on your business. On to the left print the bill to details. This means the contact details of the customer. Name, address, telephone number, email id. Also, your contact details. This you can mention either below the title or at the end of the document after the signature. 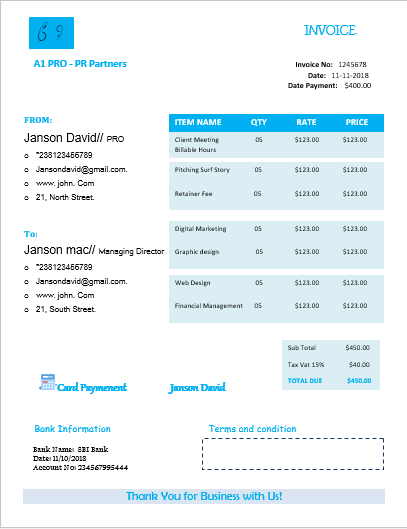 Imagine how a letterhead looks like and you can print your email id, website id, and contact details on the document either on the top or in the bottom. 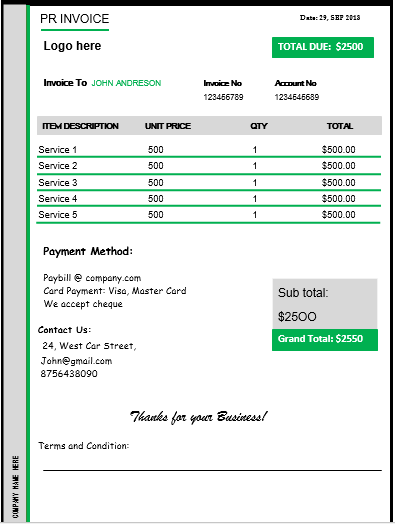 Make a table as given below and provide the details of the service you offered and the cost for each service. Mention all the details in the respective columns. Find the list of services offered by PR agencies for your reference in the section given below. You can use them and then decide the cost per hour, or assignment for each service. You can study the market and discuss with people who have experience in these lines to fix the cost. Next, make sure the optimum time required to complete the task and stick on to it. Mention the total hours. In the last column calculate the total as shown and find the total amount at the end. Now, you can include tax based on the country you reside in. Mention the total cost in words below the table. In the next line, on the left-hand side mention the date. On the right side accord the approving authority signature. Then place a seal to add more value to the bill. If you have any specific note to mention, write them, in the end, mentioning as a note or list them behind the page. You’re done and it is simple. Press releases – Written and Distributed. Blog and Copywriting for the web to spread the message via intranet and internet. Events – Creating and Executing events to reach the public and media. Promoting business by managing the criticism on social media by creating a positive vibration. Also, responding to negative opinions. What does PR stands for might be a question for many business people? Every entrepreneur wants to expand their business. They love to reach to the audience and also it a positive manner. Here is your role my dear PR agencies. Yes, public relation agencies. So in a simple word explain to your clients as follow. PR services differ from advertising through both works towards marketing a business to attract an audience. Unlike advertising agencies that get paid from the client and only spread the plus of business to promote them, you from a PR agency will anticipate, analyse, and interpret public opinion to provide necessary support to the company to grow big in spite of any criticism. In a nutshell, you can offer these services as a whole and charge your client, or provide them in one or more based on the customer need. 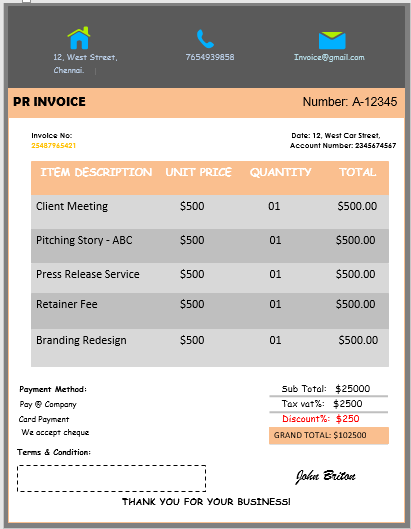 In general, you can provide any amount of PR service at any level but remember to use our invoice templates collected for your benefit for free.